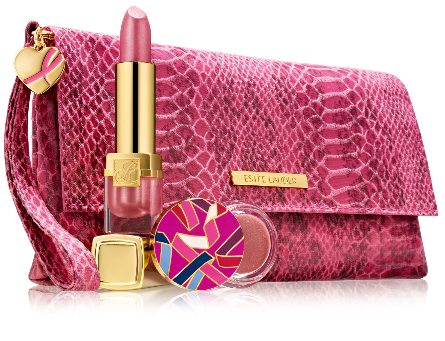 It’s that time of year again, and this year Estée Lauder think pink with their latest collection. Most of us know someone who has been affected by breast cancer, so this really is a great cause to support. The new Evelyn Lauder Dream Collection includes the Evelyn Lauder dream compact, the Evelyn Lauder and Elizabeth Hurley Dream Lip Collection, the Evelyn Lauder Dream Pin and the Perfectionist CP+R with Pink Ribbon Keychain. Each element of The Evelyn Lauder Dream Collection 2012 was designed in its entirety by Evelyn Lauder herself to celebrate the 20th anniversary of The Estée Lauder Companies’ Breast Cancer Awareness Campaign. I tried the Dream Lip Collection and I must confess to loving the rich yet natural-looking lip gloss, it comes in a lovely pink mock crock make-up bag, guaranteed to brighten you up! The design on the lip gloss lid is very eye catching and a constant reminder that there is hope for cancer sufferers. This year’s brilliant new Pink Ribbon design features a touch of blue to represent the approximately 1% of all breast cancer cases in the United States that are diagnosed in men. Available at Estée Lauder counters nationwide and at www.esteelauder.co.uk from October 2012. Evelyn Lauder Dream Compact, 2.8g RRP £55.00 Estée Lauder will donate £55.00 (the full RRP) from every sale in the UK of the Evelyn Lauder Dream Compact to The Breast Cancer Research Foundation®. Evelyn Lauder Dream Pin RRP £10.00 Estée Lauder will donate £10.00 (the full RRP) from every sale in the UK of the Evelyn Lauder Dream Pin to The Breast Cancer Research Foundation®. Estée Lauder will donate £5.00 from every sale in the UK of theEvelyn Lauder and Elizabeth Hurley Dream Lip Collection to The Breast Cancer Research Foundation®. Estée Lauder will donate £10.00 from every sale in the UK of Perfectionist CP+R with Pink Ribbon Keychain to The Breast Cancer Research Foundation®. This entry was posted in Lips and tagged Breast Cancer, Elisabeth Hurley, Estee Lauder, Evelyn Lauder Colleciton, lip gloss, lipstick. pink, pink. Bookmark the permalink.